Over the years, Military chaplains alerted us that our service men and women could also be considered “unreached” by God’s Word — not from a lack of Bibles or literacy, but because the conditions made it extremely difficult to read and concentrate … at just the time when the comfort and encouragement of God’s promises was most desperately needed. 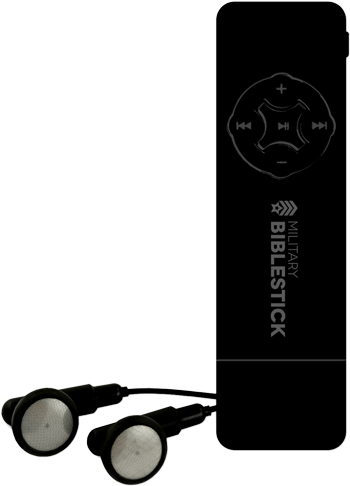 In response we developed the Military BibleStick with the Audio New Testament and selected Psalms loaded on a small digital player, specifically designed for military use. It was instantly in demand far greater than we could keep up with — and as of this moment, chaplains have delivered the Military BibleStick to more than 1 million U.S. Troops and veterans. But millions more still need the opportunity to experience God’s Word for themselves. We must help them before the battlefield takes its awful toll. God’s Word offers peace, comfort, strength, balance — real help and real hope. This is why we’re dedicated to providing Military BibleSticks, real hope for our heroes.